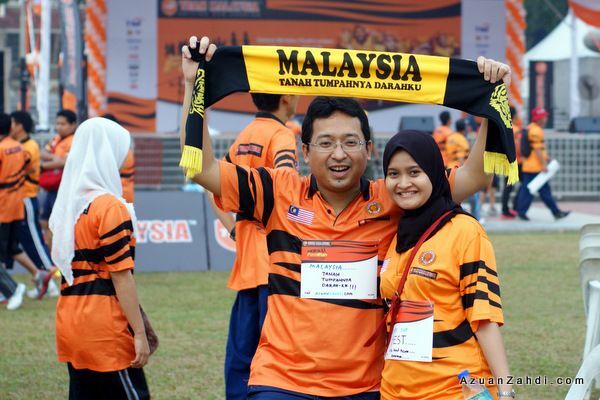 Team Malaysia Fan Run: Go Malaysia! Waking up as early as 5am is not something that I usually do on a Sunday but today I somehow managed to wake up at 4:45 am to get ready for my first ever ‘run’. 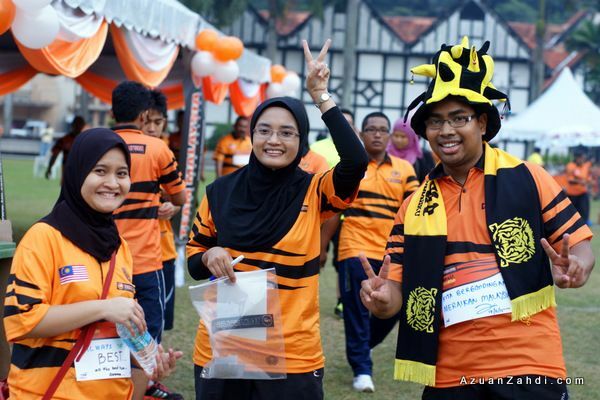 I am not a runner or a walkathon/marathon person. 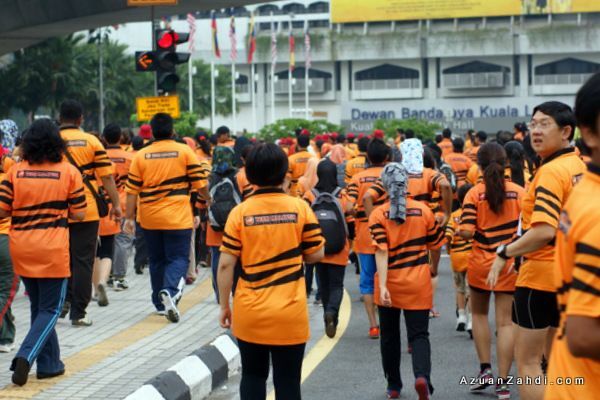 I never participate in any of the runs organised in Klang Valley despite it being the in-thing for the last 1-2 years. As a matter of fact, I am so lazy that the last time I jog was 4 months ago and the only exercise that I’ve been doing these days are walking at the airport terminal and the occasional once-a-week futsal game. 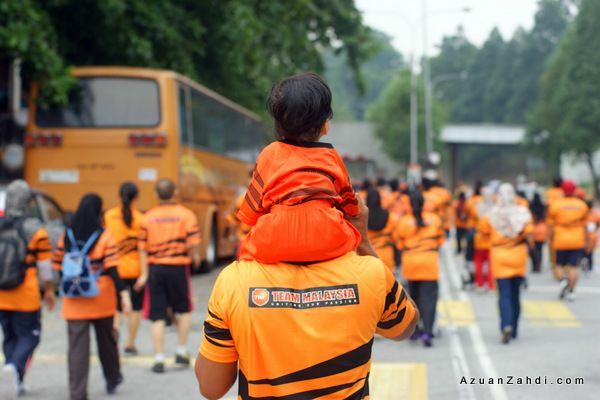 Today’s Team Malaysia Fan Run however is something special that makes it worthwhile to sacrifice my Sunday morning beauty sleep. 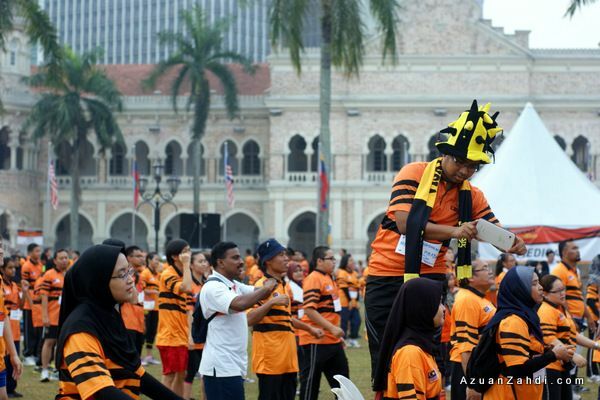 In support of the Malaysian Contingent to the London Olympics, I decided to be part of the 12,000 runners participating in the half-day event. 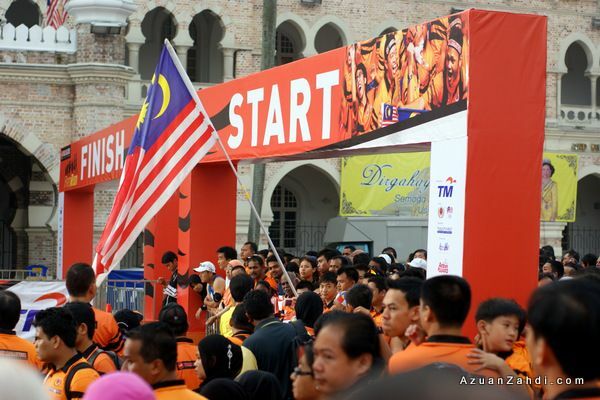 The beauty of this event is that it has a 3km category which makes it perfect for a newbie (and unfit) people like me to participate! 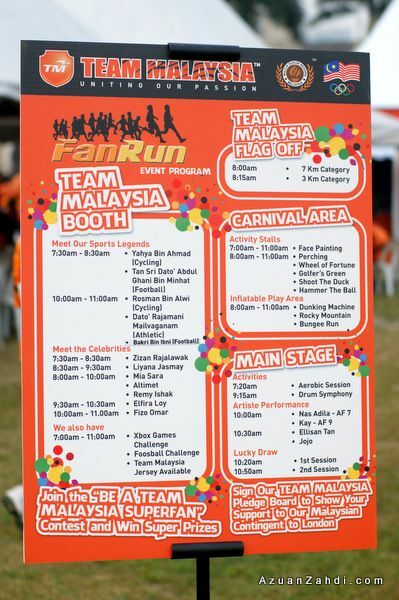 Team Malaysia Fan Run programme. 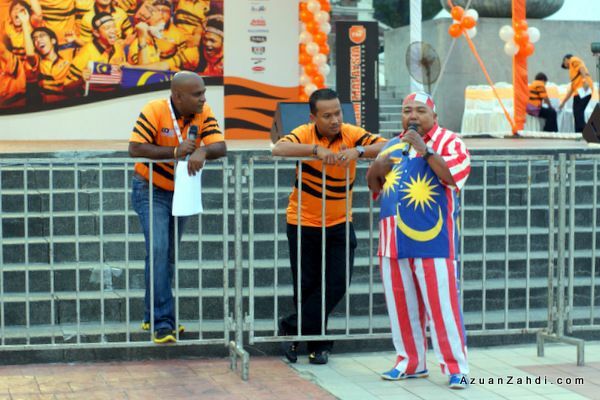 While we were enjoying the company of our friends, the emcees were busy gathering the runners, with the help of the famous Tok Moh. 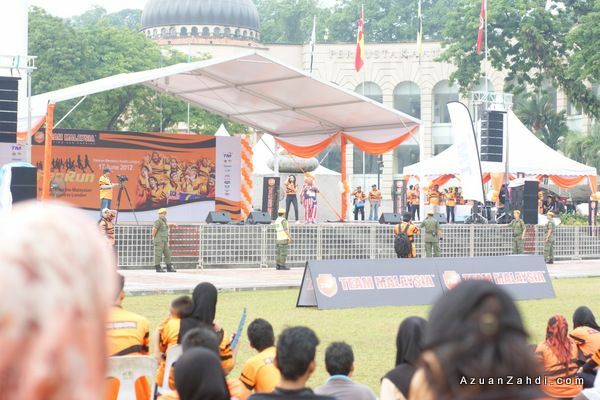 At 7:30am, the crowd started to fill up Dataran Merdeka. 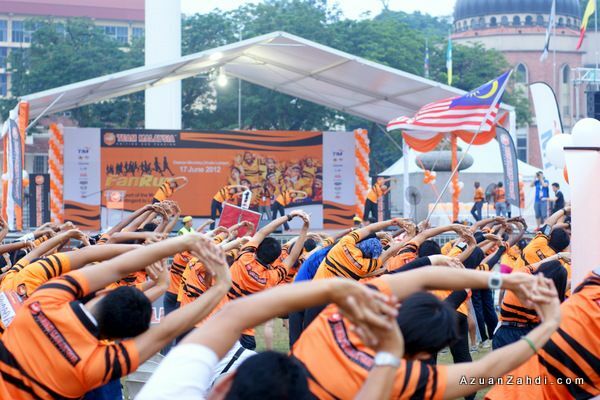 08:00am – Participants for the 7km category were flagged off. 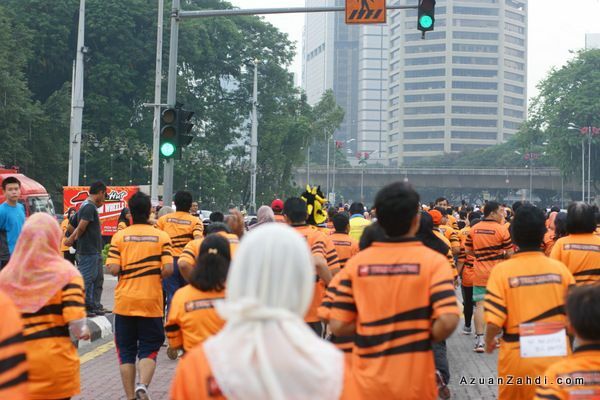 Out of the thousands participants, these few runners caught my attention the most! Super cool attire! 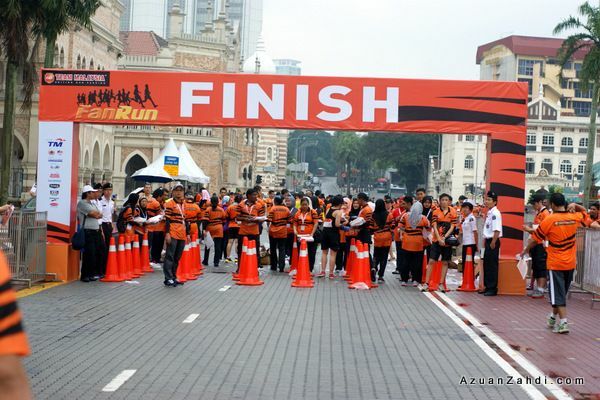 08:15am – Participants for the 3km category were flagged off. 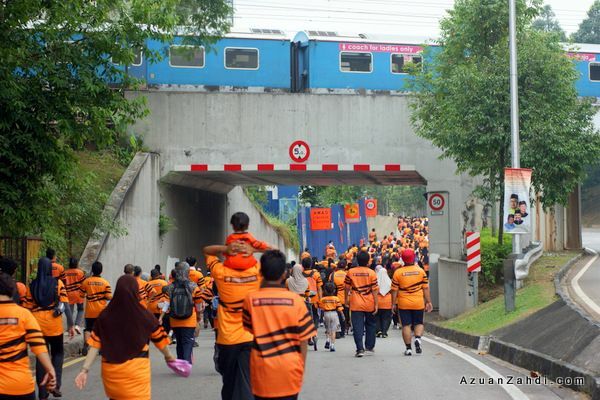 Wave of ‘tigers’ across the stretch of 3km from Dataran Merdeka. Halfway of the 3km route. 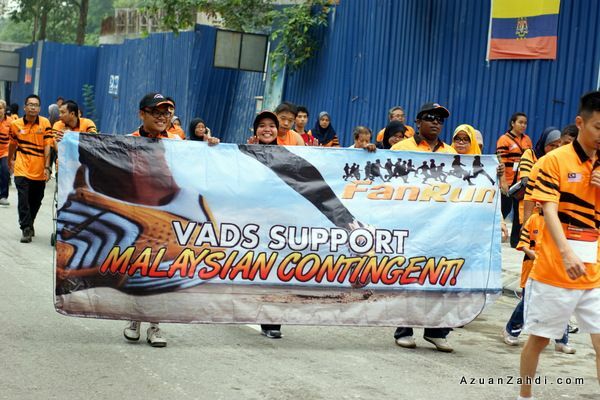 VADS, a partner of TM supporting the run as well. In action – running, jogging, walking but pretending to be running. 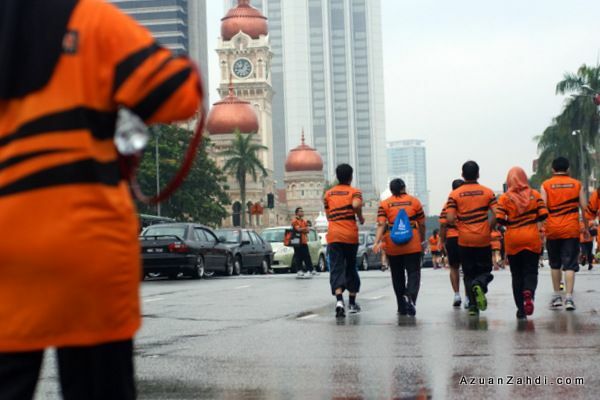 As we were enjoying the run, out of nowhere dark clouds started to cover KL’s skies bringing a good 30-minutes downpour. 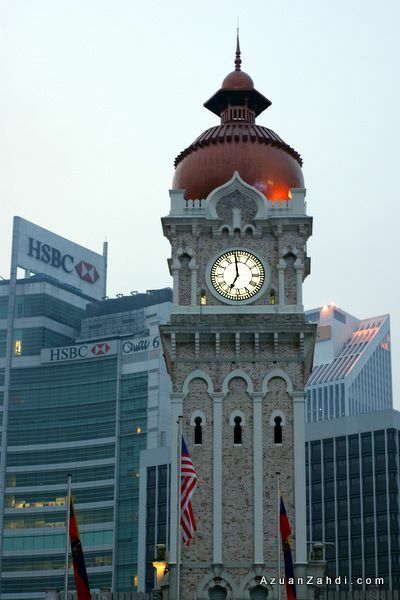 Not good for the race BUT good for the haze! We took shelter with a group of random Malaysians under a small hut and just chit chatted while waiting for the rain to stop. 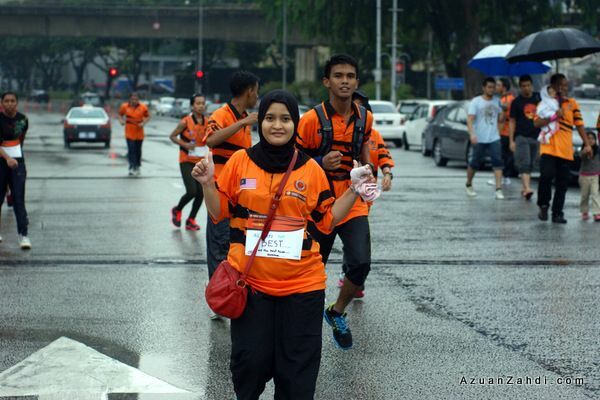 We finally completed our 3-km run while it was still raining cats and dogs. Managed to get a shot with one of the celebs invited for the event. But the real celebrity of the day was this 50+ years old auntie. 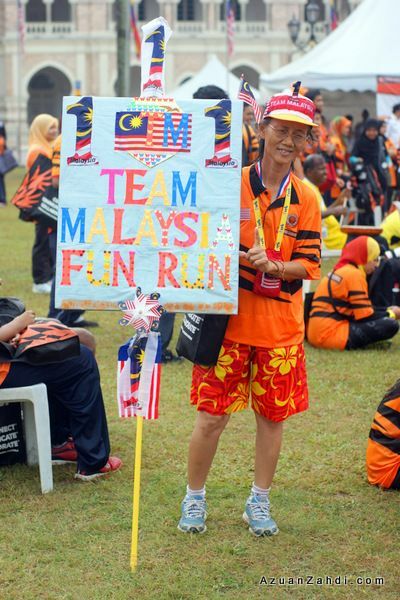 She was there throughout the event carrying her own DIY signage supporting Team Malaysia to London. I met her halfway through the run and she was running in the rain, carrying the signage and singing classical patriotic songs. Respect! Overall it was a fun way to spend a Sunday morning. 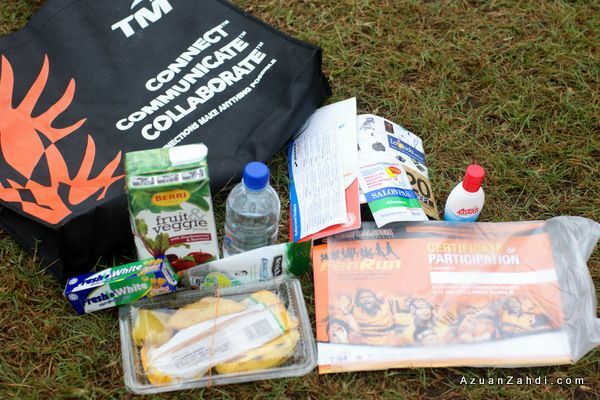 Thank you TM for taking the effort in being a strategic partner for our Malaysian sports and athletes and I shall look forward for more Team Malaysia activities in the future. The only drawback that I can see is the lack of participation of our Olympics athletes in today’s run. 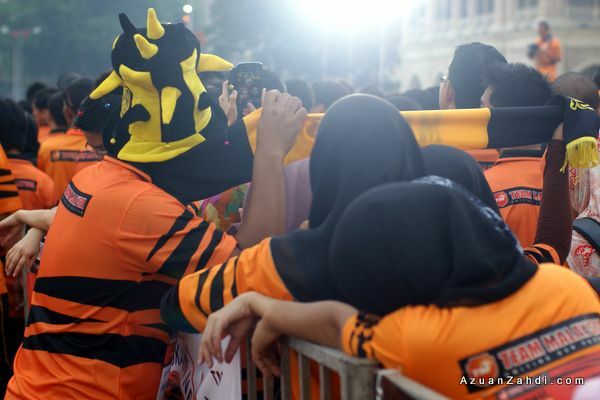 I’m sure that athletes like Lee Chong Wei and Azizulhasni Awang, our gold medal prospects would add more impact to the event. 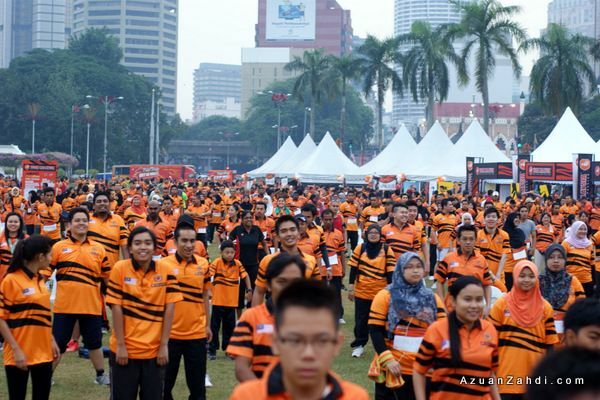 Maybe they are now busy preparing for the games but a short appearance on stage would be cool to acknowledge the 12,000 Malaysians that came down to give support to them. 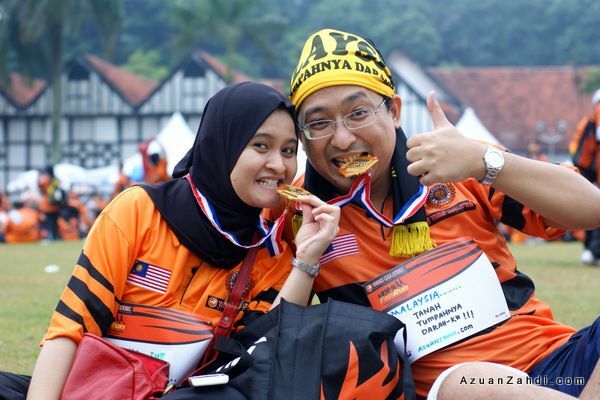 seronok duduk kl sbb banyak event etc.. tqs anway for sharing all the great pics ni… seronok nya.. patutnya kat sini pon ada TMFR ni.. 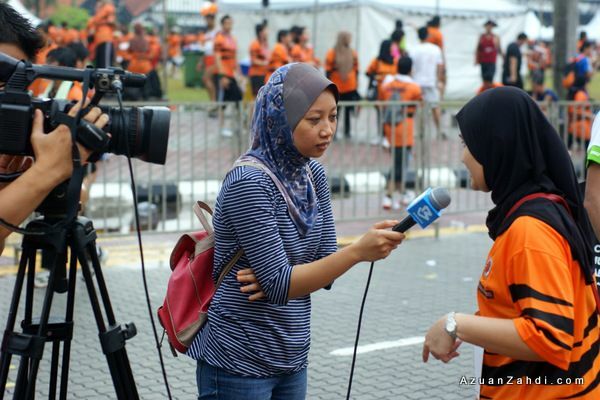 Your article content is able to push a Malaysian reader to be more patriotic. I love it! I mean, so much! Thank you for providing. 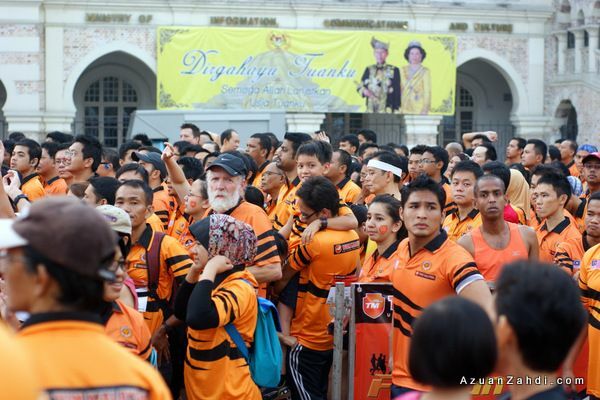 Mulan: Terima kasih 🙂 betul ia patut diadakan di lebih banyak negeri! 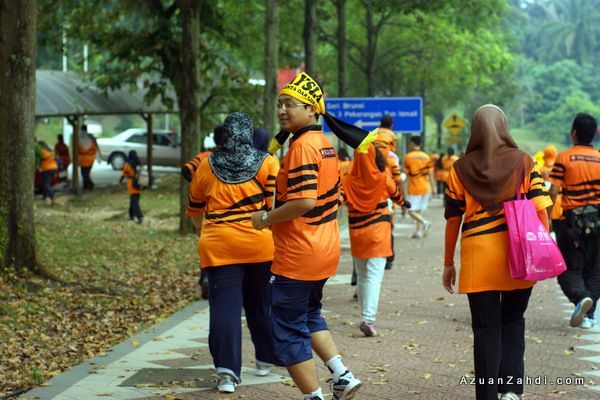 Gambar aerobic tuh (yang tangan ke kanan) cool.